Place names provide clues for understanding how people inhabit­­ a place. Wabanakis, whose name translates as “the people of the Dawnland,” are the indigenous peoples of northern New England and eastern Canada. Their place names describe a particular set of relationships to western Maine. Some names suggest how people moved over the land or—more likely—over the waters of Maine by describing the good portages and the dangerous rapids. Others mark good locations for gathering or growing food. Some of these names are still used today. Others have fallen out of use. 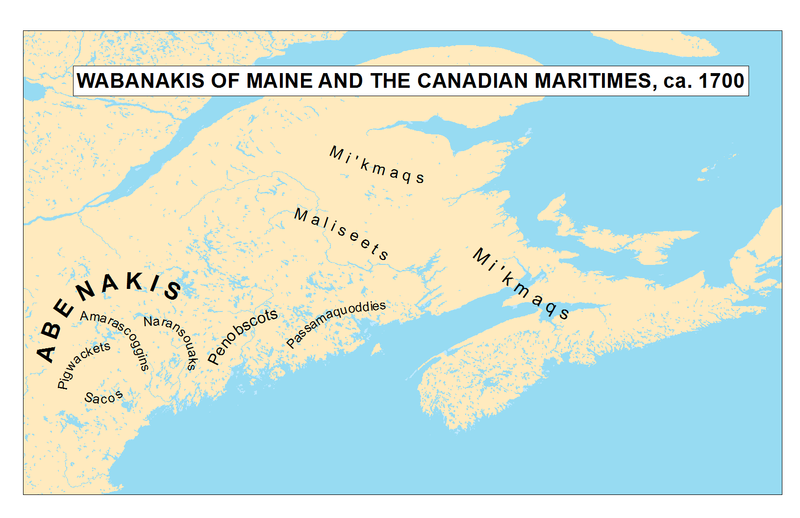 All of them describe how Wabanakis made this place their home. Four of the Wabanaki tribes have official recognition from either the Canadian or United States federal governments: the Mi’kmaqs, the Maliseets, the Passamaquoddies, and the Penobscots. A number of other groups such as the Sacos, the Pigwackets, the Amarriscoggins, and the Naransouaks (or Norridgewocks) lived as distinct groups in what is now western Maine. (These western groups are sometimes known collectively as “Abenakis,” but there was no single tribe of this name.) Wabanakis throughout the region spoke similar languages, and many had close personal ties with one another. The trials of colonization led many people in western Maine to migrate from their homelands and join other groups in Quebec or eastern Maine. Some remained in western Maine but became invisible to most of the European-American population. By the late 1600s and early 1700s Wabanakis in what is now western Maine had developed a set of practices that enabled them to thrive. Although English colonists inhabited a few small towns such as York and Falmouth (today’s Portland), Wabanakis remained the sole inhabitants of the lands away from the shore. In the spring, Wabanakis feasted on migrating fish like salmon and alewives that they caught at the falls of rivers. During the summer Wabanakis gathered in towns such as Pigwacket, Amascontee, Norridgewock, and Amarriscoggin (or Androscoggin) to grow crops like corn, beans, and squash in the fertile soils along the rivers. You can find these towns on the web map of place names. These summer agricultural communities dispersed as smaller family groups in the late fall and winter, when they sustained themselves by hunting deer, moose, and other animals. Stores of dried fish and crops that they had gathered earlier in the year also helped during these cold and sometimes lean months. Such a seasonal cycle required regular movement, and rivers provided important routes for travel by birchbark canoes. Birchbark canoes were both strong and light. Travelers who wished to avoid dangerous rapids or to travel from one river to another could follow trails known as “portages” or “carries.” Wabanakis traveled extensively to obtain important resources, to visit friends and relatives, or to attack enemies.